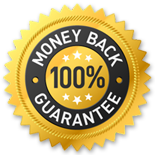 30-Day Money Back Guarantee. If you are not satisfied that the land you purchased is all that we said it was, we will refund your money in full or exchange it for a similar priced parcel of land in our portfolio. In addition we also collect information on your IP address, browser type, and Refer URL data. We use this data to prevent hacking attempts, help us know what web browsers people are using and find out where our visitors are coming from so that we can improve our marketing. Your information is only used to fill and maintain your order. We do not sell or redistribute your information to ANYONE.